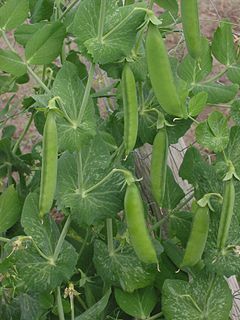 Peas is an annual plant. In gairdenin, an annual plant is a plant survivin juist for ae growin saison. Mony fuid plants is, or is grown as, annuals, includin virtually aw domesticatit grains. Some perennials an biennials is grown in gairdens as annuals for convenience, pairticularly gif thay arenae considered cauld hairdy for the local climate. Carrot, celery an parsley is true biennials that is uisually grown as annual crops for their edible ruits, petioles an leafs, respectively. Tomato, sweet tattie an bell pepper is tender perennials uisually grown as annuals. Ornamental perennials commonly grown as annuals include impatiens, wax begonia, snapdragon, Pelargonium, coleus an petunia. This page wis last eeditit on 23 Dizember 2015, at 22:15.